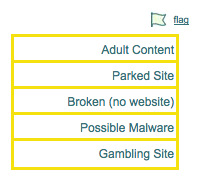 Click the small green flag near the top left of the page (you must be logged in), then "adult content", and then "yes" to confirm. Why is my page flagged as Adult? Pages are marked as usually marked as adult by two means. Either someone visits your site, finds the content inappropriate and flags it as adult or during page creation the AboutUsBot detects adult keywords on the site and marks the AboutUs page as containing possible adult content. Often the bot is not sensitive enough to differentiate the nature of keywords and picks up false positives marking your page as adult. Is a page improperly flagged? Clicking "Yes" to view the possible adult content as a logged in editor. Then click the orange box at the top left that says "adult". When it turns green and says "unflag as adult" click that and then "Yes". or Contact us to have this done for you. See the AboutUs AdultContentPolicy for more information.